I saw these brinjal boats on Sapna Sardessais Facebook page the other day. She is a well-known personality in Goa and has published many famous cook books. She keeps posting amazing photos of dishes cooked in her kitchen on her facebook page and are absolutely drool worthy. Thanks Sapna for this recipe. These boats are very simple to make and are deliciously tasty. Do try them. Here is the recipe. Cut the brinjal length wise and scoop out the center with spoon to make 8 hollow boats. 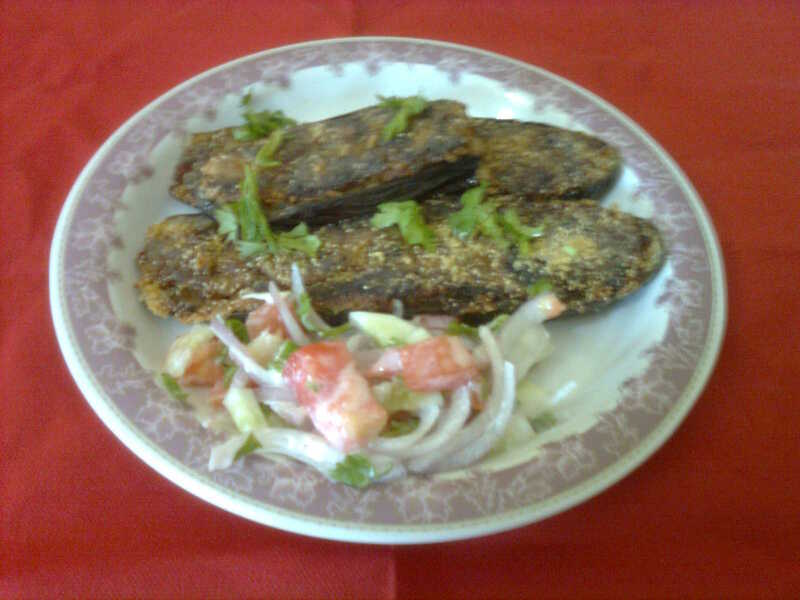 Chop the scoped brinjal into fine pieces and keep aside. Heat 1 tsp oil and fry onions till light brown. Add ginger garlic paste and all the masalas and stir fry for a minute. Now add chopped brinjal and cook till the brinjal is cooked and is mushy. Add boiled potatoes, coriander leaves and salt. Mix well and switch off the gas. Apply a little salt to the hollow brinjal boats and leave it for 5 minutes approx. Stuff the brinjal potatoes stuffing in the hollow brinjal to make a boat. Stuff all the brinjals, coat them with fine semolina or bread crumbs and shallow fry on the both the sides till the brinjal skin gets cooked. Posted on November 4, 2012 by Varsha	• This entry was posted in Starters, Uncategorized, Veg Side Dish. Bookmark the permalink. Unfair. Am a fan of Sapna and would rather read her recipes on her own page… Would love to read ur recipes on urs. Being a foodie couple, cooking is our passion. We not only try out altogether new recipe’s but also try interesting ones we find on restaurant menus/other blogs/cookery shows. Please understand that this blog is only a consolidation of this effort, to help food enthusiast (probably like you), find delicacies (particularly Goan) under one umbrella. We have never quoted to be the original author of some recipe’s listed on our blog. Due credit (and links) have been provided to the original tastemakers. This is a normal blogging practice amongst bloggers, nothing unfair about it. Please feel free to visit our space (and other similar blogs too) in future, else in your pursuit for originality you may miss out on some delicious, mouth-watering, sumptuous, lip-smacking recipes. Cheers.